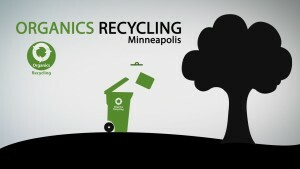 To take part, residents must sign up by contacting Solid Waste and Recycling at 612-673-2917 Monday–Friday 8 a.m.–4:30 p.m. or at SWRcustomer@minneapolismn.gov. Organics include: All food scraps, most non-recyclable food-soiled paper, certified compostable plastics and more! Your organics must be contained in a certified compostable bag or in a paper bag prior to it being brought to the organics drop-off. Large paper items such as pizza boxes, wax-coated boxes and egg cartons do not need to be bagged. Below is more detailed information on the items that can and cannot be included in an orgnaics drop-off. Note: Meat, fish, bones and dairy items are accepted at the residential organics drop-off because the organics are brought to a commercial composting facility where temperatures remain hot enough for long enough to kill any pathogens and break down these items. These items should not be placed in a backyard compost bin. All paper, non-plastic lined plates, cups, bowls, etc. Food soiled paper and paper products whose fibers are too short to be recycled including: paper towels, napkins, facial tissues, tissue paper, paper egg cartons, pizza boxes, etc. Note: If paper can be recycled, it should be recycled. In order to be accepted in the organics drop-off program, plastics need to pass testing standards (ASTM D6400 or ASTM D6868) that guarantee the plastic will break down in a commercial composting facility. The Biodegradable Products Institute (BPI) and the United States Composting Council (USCC) have created the logo shown to the right that is found on all plastic items that meet this certification. A catalog of compostable plastic items that meet the compostability standards can be found on BPI’s website.